A couple of months ago, when this blog was as fresh as a newborn baby, Gretchen from Canela y Comino tagged me with a meme to name five interesting facts about myself. I mentioned there that Guillermo and I were married in a Ukrainian church in Bowen-it’s called Nuestra Señora del Perpetuo Soccorro-Our Lady of Perpetual Help. Fr. Ismael, the priest, does mass every week in Spanish and in Ukrainian. 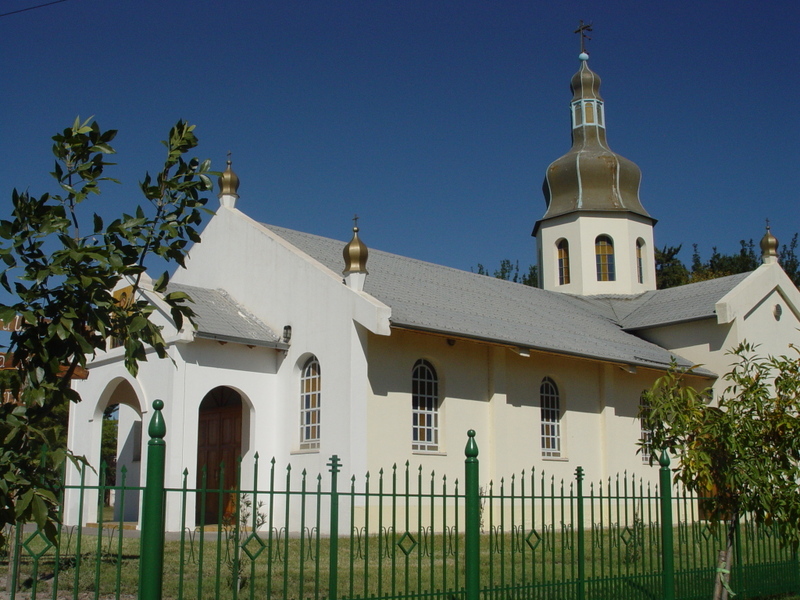 The church is in Bowen, an area that at one time was populated primarily by Ukrainian and Russian immigrants. It was the dream of Fr. Basilio, a Ukrainian priest who wanted to minister to the Ukrainian farming community. He didn’t live to see the construction of the church completed, but was instrumental in raising the money to build it, and in getting the dome made. Unlike many other Catholic churches, the adornment in this church is simple-the stained glass windows are blue and yellow cross patterned, the walls are white, and the pews are of unfinished wood. The exception is the cloth used on the alter and in ceremonies-hand embroidered in typical Ukrainian style with intricate red crosses. The portrait of the Virgin Mary is in the Byzantine style of Russian icons. Since I got tagged with that meme in February, this blog has grown like a vine! Over the past 4 months, I have met some amazing people, and have had readers from all over the world and most of the 50 states-many of whom have sent me emails. It’s just incredible to me to be connected this way. On another note, this has been an exciting week! Thank you!! I will be thinking about who else to pass it along to! I also received another award this week: Adam Roberts, author of the blog Amateur Gourmet and host of the Food Network show the FN Dish did a show last month about food blogging called Meet the Bloggers where he challenged new food bloggers to submit their pages so he could choose his favorite. And guess what? From Argentina With Love won! It’s Adam Roberts’ favorite new food blog!Congratulations also to the two other winners, The Guerrilla Gourmet and The Arugula Files. A big thank you to Adam, of course, and to all the other readers of this blog, both returning and new! WOW! I can’t wait to see what happens next week! Hi Rebecca – gorgeous photo and I’m sure it was a beautiful setting for your wedding! I had fun taking a tour of the clip, the other winners, etc. CONGRATS! Looks like a beautiful place for your wedding! And congratulations on your first place honor — I am a proud blog mom! Very nice looking church. The inside must be very nice as well as peaceful, too. Congrats on your latest accomplishments! Yay! Good morning Rebecca! this church is fantastic! Congrats for the award so deserved dear! Congratulations, Rebecca. Your award is well deserved.